Like all strongest modern chessplayers, the article's hero is marked out as a very good specialist in the early opening-middlegame stage. And in certain openings his play is simply superb. I should emphasize Leko's truly classical approach to the French defense (as White) – I think he is actually the world's greatest expert in this field. 1.e4 e6 2.d4 d5 3.¤c3 ¤f6 4.Ґg5 Ґb4 5.e5 h6 6.Ґd2 Ґxc3 7.bxc3 ¤e4 8.Јg4 ўf8 9.Ґd3 ¤xd2 10.ўxd2 c5 11.¤f3 ¤c6 12.dxc5. Not a rare positional idea – White does not allow an opponent to lock the queenside by c5-c4. 12...Јa5 13.Јf4 Јxc5 14.¤d4 Ґd7 15.¦hb1 b6. Better was 15...¤d8 … ¦c8, not allowing weakening the queenside, although the piece passively. 16.a4 ¤a5 17.Ґa6 Ґc8?! As it sometimes happens in the French, Black had to keep a bad bishop: 17...¤c4+!? 18.Ґxc4 dxc4 with adefendable position, because White can't open up the queenside – Black can always respond to a5 with b5. 19.¤c6! Not only strong, but also practically forced move – White opens up the game, utilizing black king stuck on f8. 19...¤xc6 20.Ґxc6 ¦b8. 20...Ґb7 deserved serious consideration: 21.Ґxb7 Јxb7 22.a5 ¦b8 23.axb6 axb6 24.¦a3 ўg8 25.¦ab3 (25.¦ba1 Јc7) 25...Јc7 26.Јe3 ўh7 27.¦xb6 ¦xb6 28.¦xb6 ¦c8 – it is difficult for White to convert his extra pawn. 21...Ґb7 was probably better 22.axb6 Ґxc6 23.bxa7 ¦e8 24.¦b8 ўg8 (24...Ґa8 25.¦ab1ќ, and then exchange on e8 and ¦b8) 25.a8Ј (25.Јb4 Јg5+) 25...Ґxa8 26.¦axa8 ¦xb8 27.¦xb8+ ўh7. 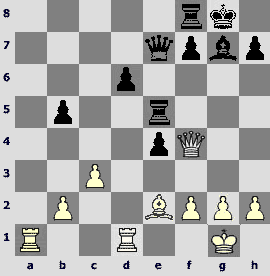 White won a pawn, but it is not easy to win the game either in queen's or heavy pieces' endgame. Probably White should exchange rooks and start preparing c3-c4 carefully. This invasion as a matter of fact decides the game. 24...¦xh2 25.c4!, creating a threat of capturing on d5 and c4-c5 (25.¦ba1 seems weaker: 25...¦xg2 26.ўe3 ¦g4 27.¦a8 ¦e4+ 28.ўd3 ¦xa8 29.¦xa8 ¦xe5 30.¦xc8+ ўe7 31.¦b8Іwith little winning chances) 25...¦xg2 26.ўe3 ¦h2 (26...d4+ 27.ўe2 ¦h2 28.c5ќ) 27.c5 ¦h3+ 28.ўd2 ¦f3 29.¦xb6 ¦xf2+ 30.ўc3, and White not only wins a piece, but also queens his pawn. 25.c4! Quite playable was the immediate 25.¦ba1 fxe5 26.¦c7 ўg8 27.¦aa7 ўh7 28.¦xg7+ ўh6, but in any case White can't make progress without c3-c4 – the bishop must play. 25...¦h4 [25...dxc4 26.¦ba1 ўg8 27.¦c7ќ] 26.cxd5 ¦d4+ [26...exd5 27.¦e1 Ґf5 28.e6ќ] 27.ўc3 fxe5 28.¦b4! Exchanging the last active piece of Black. 28.¦e1 exd5 29.¦xe5? ¦c4+. 31...Ґf7 32.¦a8ќ ¦xa8 33.Ґxa8 d4 34.ўxd4 ўe7 35.ўe5 Ґe6 36.Ґe4 Ґd7 37.c3 Ґe6 38.Ґg6! With the following maneuver White wins weakg5-pawn. 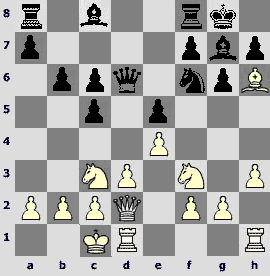 In the 8...ўf8 variation Leko won a classical game against Korchnoi: 9.Ґd3 ¤xd2 10.ўxd2 c5 11.h4 c4 12.Ґf1 ¤c6 13.¤e2 b5 14.¦h3 a5 15.a3 Ґd7 16.¤f4 ¦g8 17.¦f3 ўe7 18.¤h5 b4 19.Јf4 bxc3+ 20.ўe1 Ґe8 21.¦xc3 a4 22.¦g3 Јa5+ 23.c3 ¦b8 (due to a grievous location of the second rook, Black can't create a real counterplay along the b-file) 24.Ґe2 ¦b3 25.Јd2 g6 26.¤f6 ¦h8 27.Ґd1 ¦b7 28.Ґc2 ўd8 29.¦b1 ¦xb1+ 30.Ґxb1 ўc7 31.Ґc2 Јb5 32.¦f3! ¤d8 33.Јc1 h5 34.ўd2 ¤b7 35.Јb1 ¤a5 36.¤xe8+ Јxe8 37.Јb4! 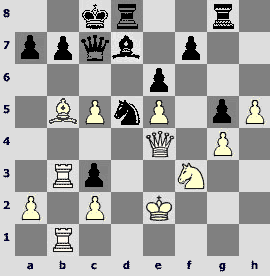 (Black did not have time to cover the file, which he opened earlier, seeking counterplay) 37...¤b3+ 38.ўe3 Јd7 39.Јd6+! 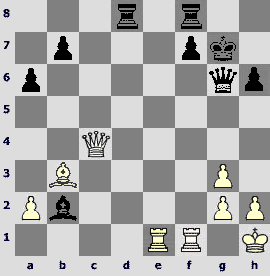 Јxd6 40.exd6+ ўxd6 41.¦xf7 ¦a8 42.¦g7 ¦b8 43.¦a7 ¦g8 44.g3 ўc6 45.¦xa4, and the endgame is easily won. 9.Ґd3 ¤xd2 10.ўxd2 c5 11.h4. 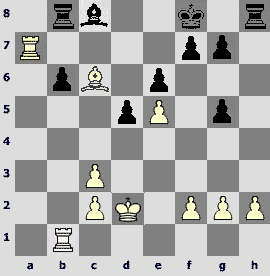 Here it is even more justified than in the ўf8 variation – White has a catch: the g6-pawn. 11...Ґd7. There is another continuation used, for instance, by Igor Glek – 11...¤c6 12.Јf4 cxd4 (12...Јa5 13.h5 gxh5 14.¤f3 b6 15.¦xh5 Ґa6„ Kovalev – Glek, Germany 1994) 13.cxd4 Јa5+ 14.c3 b5„ (Sutovsky – Glek, Essent 2000). 14...Јa5!? Playing for complications. The main line is (and will remain after this game) 14...Јxg5+ 15.Јxg5 hxg5 16.ўe3І g4 (to prevent creating a protected passed pawn after White's eventual g2-g4) 17.¦f1 (or 17.Ґe2 cxd4+ 18.cxd4 f6 19.exf6 ўf7 20.Ґb5 ўxf6 21.¦f1+ ўg5 22.¦f7 Ґe8 23.¦g7+ ўf6 24.¦xg4 ¦xh5 25.¤h3 ¤xd4!іKarjakin – Cebalo, Biel 2003) 17...ўe7 18.¦h4 ¦ag8 19.¦b1 b6 20.Ґe2 cxd4+ 21.cxd4 f5= 22.exf6+ ўxf6 23.¦f1+ ўe7 24.¦xg4 ¦xg4 25.Ґxg4 ¤xd4 26.ўxd4 with a draw (Leko – Short, Batumi 1999). 15.dxc5 d4 16.¤f3 0–0–0 17.¦ab1. 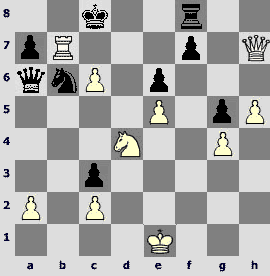 A new move, which is quite logical – White uses the open file to play against black king. 17...dxc3+ 18.ўe2 ¦hg8. 18...hxg5 deserved attention – Black could save a tempo compared to the game. 19.Јe4. Protecting very important e5-pawn. 19...Јc7! Black has his own chances due to relatively poorly placed white king – with the text he prepares a standard maneuver ¤e7-d5 and Ґc6. 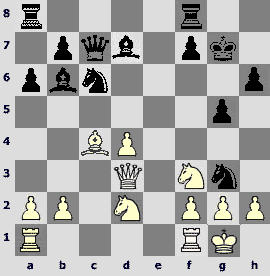 Khalifman often played like this in similar positions. 19...hxg5 20.g4±. 20.g4 ¤e7 21.Ґb5! 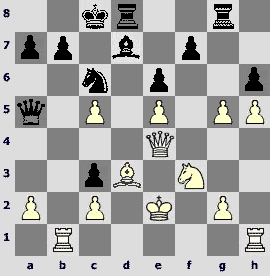 And again White has no time to take the pawn – 21.gxh6 Ґc6„ with excellent counterplay. 21...hxg5 22.¦b3! 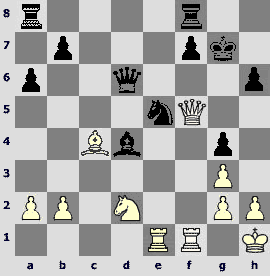 White's play on the b-file proves sufficient to neutralize the opponent's actions. 23...Ґc6? Surprisingly, this loses. The correct 23...f5 (a logical follow-up of Black's sharp play) already appeared in the online commentary 24.exf6 ¤xf6. However, it is not a panacea: 25.Јe5 Ґxb5+ 26.¦xb5 ¦d2+ 27.ўe1 Јxe5+ 28.¤xe5І, and Black has problems in the sharp ending – one has to meet both the queenside threats and the passing h-pawn. For example, 28...¦g7 29.¤c4 a6 30.¦5b3 ¦xc2 31.¤d6+ ўd8 32.¤xb7+ (not 32.¦xb7 as there is 32...¦d7 33.¤f7+ ўe8 34.c6 ¦dd2, forcing exchanges 35.¦b8+ ўxf7 36.¦1b7+ ¤d7 37.¦xd7+ ўf6 38.¦f8+ ўe5 39.¦xd2 cxd2+ 40.ўd1 ¦xc6 41.ўxd2 with a draw) 32...ўe7 33.¤d6 ¤d7 34.¦b7 ¦xa2 35.¦c1 ¦g2 (35...c2 does not work: 36.¤c4 ўf6 37.c6 – the pawn queens, and the counterplay does not work out: 37...¤c5 38.¦xg7 ¤b3 39.c7 ¤xc1 40.¦f7+! (White must parry the threat ¤d3 with a tempo) 40...ўxf7 41.¤e5+ ўf6 42.c8Јўxe5 43.Јc3+, and White wins a knight) 36.¦xc3 ¦xg4 37.c6! ўxd6 38.cxd7, winning. 24.Ґxc6 Јxc6 25.¤d4!ќ. It turns out that Black can't protect on b7. 25...Јa6+. Alas, 25...¤f4+ 26.ўf3 ¦xd4 is impossible in view of 27.Јxc6+ bxc6 28.¦b8+ ўd7 29.¦1b7#. 26.ўe1 ¦d7 27.c6 ¦c7 28.¦xb7 ¦xb7 29.¦xb7 ¤b6. After 29...Јa3 the king escapes easily: 30.¤b5 Јc1+ 31.ўf2 Јd2+ 32.ўg3ќ. 31.Јg7. A sympathetic combination in the end. 31...Јa3 32.Јxf8+! 1–0. 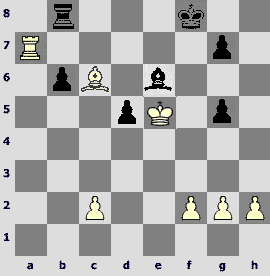 Black resigned in view of 32...Јxf8 33.¤b5 Јc5 34.¤d6+ ўd8 35.c7+ Јxc7 36.¦xc7 ўxc7 37.h6, and the pawn queens. I have a déjà vu feeling – the moves are simple and natural (rooks are along open files, passers go forward, etc), calculation is timely and precise, and I only wonder how could such a strong grandmaster as Radjabov think that his counterplay is sufficient! As for Leko's opening repertoire as Black, apart from the Petroff's defense, which became a standard tool for almost all the top players, he often and successfully employed the Sveshnikov Sicilian (and all anti-Sveshnikov schemes). 1.e4 c5 2.¤f3 ¤c6 3.d4 cxd4 4.¤xd4 ¤f6 5.¤c3 e5 6.¤db5 d6 7.Ґg5 a6 8.¤a3 b5 9.Ґxf6 gxf6 10.¤d5 f5 11.Ґd3 Ґe6 12.0–0 Ґxd5 13.exd5 ¤e7 14.c3 Ґg7 15.Јh5 e4 16.Ґc2. 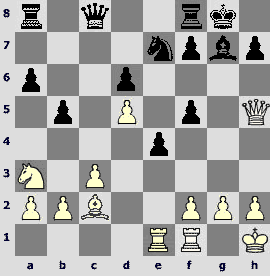 Recently (2003-2004) people playing White (and Leko as well) preferred 16.Ґe2. 16...0–0 17.¦ae1 Јc8 18.ўh1. The following Leko's novelty practically excluded this move from grandmaster practice, forcing White to return to 18.Ґb3 a5 (18...¤g6 19.¤c2 ¦e8 20.f4 exf3 21.¦xe8+ Јxe8 22.Јxf3 f4 23.¦e1 Јd7 24.¤b4ІPonomariov – Anand, Mainz 2002) 19.Јg5 Јb7 20.f3 h6„ (Shirov – Kramnik, Shirov – Grischuk, Wijk aan Zee 2003). 18...¦b8! An energetic move, invented by Leko before the candidates tournament. Black actively seeks counterplay. Other options are 18...¤g6; 18...¦e8. 19.f3. 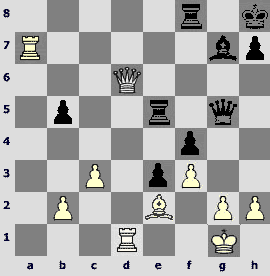 Sharp 19.g4 did not bring success to White in the candidates final – 19...b4 20.cxb4 ¤xd5 21.gxf5 ўh8 22.¦g1 Ґxb2! 23.Јh6 Јc3! 24.¦xe4 (24.Ґxe4 Јf6 25.Јxf6+ ¤xf6 26.¤c2і) 24...Јf6 25.Јh3 ¦g8 26.¦f1 Ґxa3 27.Јxa3 ¦bc8 28.Ґd1 ¤c3 29.¦e3 d5, and Black has advantage (Topalov – Leko, Dortmund 2002). 19...b4 20.¤b1. Somewhere here it was time for White to secure an equality by 20.fxe4 bxa3 21.exf5 ¦xb2 22.f6 ¤g6 23.fxg7 ўxg7 24.Ґd3 Јxc3 25.¦e3 ўg8! 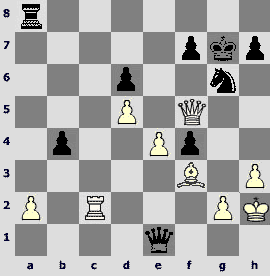 26.Ґxg6 hxg6 27.¦xc3 gxh5= and the endgame is even (Dominguez – Schandorff, Esbjerg 2003). 20...bxc3 21.bxc3 Ґxc3 22.¤xc3 Јxc3 23.fxe4. After this move Black gets the advantage. White should have taken a drawing variation 23.Ґb1 exf3 24.¦xe7 fxg2+ 25.ўxg2 ¦xb1 26.¦xb1 Јc2+ 27.¦e2 Јxb1 28.Јg5+ ўh8 29.Јf6+ ўg8=, and as White can't bring his rook to the g-file, the game ends in a draw by perpetual (S.Zagrebelny). 23...f4! 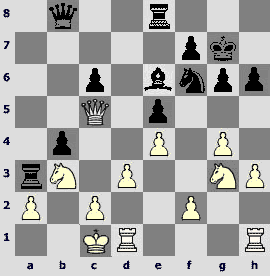 Leaving White with a bad bishop – in accordance with the best traditions of the Sicilian and King's Indian. 24.Ґb3. The bishop stands here too passively, better was 24.Ґb1!? … e4-e5: Leko planned to continue 24...Јe5 [24...¤g6 25.e5 dxe5 26.d6 (26.Ґxg6 hxg6 27.Јxe5 Јxe5 28.¦xe5 ¦b2 29.h4 ¦xa2 30.¦xf4=) 26...¦fd8 27.¦d1 ¦xb1 28.¦xb1 ¦xd6›] 25.Јxe5 dxe5 26.Ґd3, and here he was ready to sacrifice the a6-pawn for the knight's transfer to d6. 24...¤g6 25.¦c1 Јf6 26.Јf5 Јe7. Black is better, because of White's poorly placed bishop. 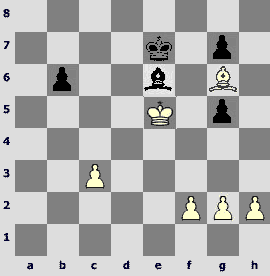 If White wants to play actively, he must remove his rooks from the 1st rank, consequently weakening the king. 27.¦c4 a5! 28.h3 ¦b4 29.¦xb4. Better was to avoid this exchange and not to open the a-file: 29.¦fc1і. 29...axb4 30.Ґd1. It turns out that the bishop has nothing to do on this diagonal as well. More sensible is 30.Ґc2!? 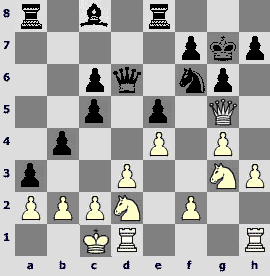 and Ґb1, to defend the a2-pawn and have e4-e5 in a possession – S.Zagrebelny. 30...¦a8 31.¦f2. Allows Black to transfer the queen. Leko considers 31.Ґb3!? as White's best option. 31...Јa7 32.¦c2 ўg7 33.ўh2 [33.Ґh5 b3! 34.axb3 Јe3° и ¦a1] 33...Јe3 34.Ґf3 Јe1. Now White has to deal with b4-b3 and rook's invasion on a1. He tries to distract the opponent by counter-threats. 35.¦c7 Јg3+ 36.ўh1 ¤e5 37.Ґh5 ¦xa2 38.¦xf7+ ¤xf7 39.Јxf7+ ўh6 40.Јf6+ ўxh5 41.Јf5+ ўh6 42.Јf6+ Јg6. The perpetual isn't there, black king easily escapes to the queenside. 1.e4 c5 2.¤f3 ¤c6 3.Ґb5. As we could see in the previous match game, one of the main lines in the Sveshnikov only disappointed Alexey. 3...g6 4.Ґxc6 dxc6 5.d3 Ґg7 6.h3 ¤f6 7.¤c3 0–0 8.Ґe3. The match situation dictates Shirov a sharp plan with long castling (the alternative is short castling, ¤h2, f2-f4). Three years later in Monaco (rapid) Shirov selected 8.Ґf4 (preventing e7-e5), Leko replied with 8...¤d7, and after 9.Јd2 (before that Ґf4 was usually linked with e4-e5) 9...¦e8 10.Ґh6 Ґh8 11.h4 e5 12.h5 ¤f6 13.hxg6 hxg6 14.0–0–0 ¤g4 15.Ґg5 Јd6 16.¤h4 Ґd7 17.f3 ¤f6 18.¦h2 ¤h7 19.Ґe3 Ґg7 20.¦dh1 ¤f8 21.Ґh6 Јf6 22.Ґxg7 ўxg7 23.¤e2 ¤e6 24.g3 ¦h8 25.f4 White obviously outdid his opponent in developing the initiative. Probably Black's idea with ¦e8 and Ґh8 was not very good. 8...b6 9.Јd2 e5 10.Ґh6 Јd6 11.0–0–0. One who plays this variation as Black can easily study it on Leko's games: 11.g4 Ґe6 12.¤e2 (12.Јe3 a5 13.¤e2 a4 14.a3 b5 15.¤g3 ¤e8 16.0–0 f6 17.¤d2 ¦d8 18.Ґxg7 ¤xg7 19.f4 exf4 20.Јxf4 Јxf4 21.¦xf4 c4! 22.¦f3 Ґc8 23.¤df1 ¤e6 24.¤e2 cxd3 25.¦xd3 ¦xd3 26.cxd3 ¦d8і,and White only hopes to survive, Ponomariov – Leko, Linares 2003) 12...¦ad8 13.Ґxg7 ўxg7 14.Јc3 ¤d7 15.¤g5 h6 16.¤xe6+ fxe6!? 17.ўf1 ¦f3 18.ўg2 ¦df8 19.¦af1 – draw (Bologan – Leko, Linares 2003). 11...a5!? Leko concluded that in such positions the most precise plan is to push the a-pawn in order to threaten a4-a3 and Јd4 at the right time and to bother opponent's king in general. In Dubai 2002 against Grischuk he played 11...b5 and conducted a plan with c5-c4. 12.Ґxg7 ўxg7 13.g4. White continues with his own idea. He wants to transfer a knight on g3 (and perhaps to bring another one on h4) and to terrorize the opponent with various checks from f5 and h5. 13...a4 14.¤e2 [14.¤h4!? … f4 – L.Ftacnik] 14...b5 15.¤g3 b4 16.Јg5 ¦e8 17.¤d2. White moves the knightvia e3 on c4, incidentally defending the own king. This is a logical and healthy idea. 17.¤h4!? 18.bxa3? Positional consequences of this move are just terrible! White refuses the natural 18.b3 purely on sporting grounds. 18.b3 Јd4 19.¤c4 h6! (weaker is 19...Јa1+ 20.ўd2 Јc3+ and, as S.Zagrebelny pointed out, there is no perpetual check: 21.ўe2 Јxc2+ 22.¦d2 Јc3 23.¤e3 with strong threats ¦c2 and¤f5+) 20.Јe3 Ґa6=. 18...h6 19.Јe3 Ґe6 20.¤b3. White can't protect his king anyway. 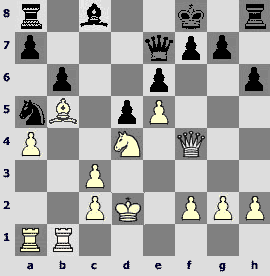 It was better to start a counterattack: 20.g5 hxg5 21.Јxg5 Јd8 (21...¦xa3? 22.¤c4! 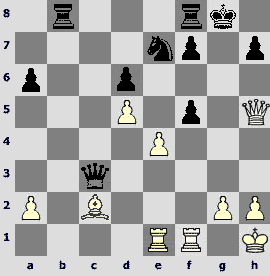 Јd4 23.¤xa3 bxa3 24.ўd2І) 22.¤f5+ Ґxf5 23.exf5, and the things are not that bad for White, e.g. : 23...¦xa3 24.fxg6 ¦xa2 25.gxf7+ ўxf7 26.¤b3 Јd5 27.¦hg1 ¦g8 28.Јf5 ¦xg1 29.¦xg1 c4 30.dxc4 Јxc4 31.ўb1›. Black stands so great positionally that he only needs to bring pieces into the attack. 22.ўb2 ¤d7! 23.Јe3 ¤b6 24.¦a1 c5. Или 24...¤a4+ 25.ўc1 Ґxb3 26.cxb3 ¤c3 (Leko). 25.ўc1 [25.¤xc5? ¤c4+! 26.dxc4 ¦xe3°] 25...c4 26.dxc4 ¤xc4 27.Јe1 Јa7° 28.Јxb4 Јxf2 29.¤f5+ gxf5 30.gxf5 ¦c8 31.fxe6 ¤e3 0–1. The game was declared the best one in Dortmund 2002. And now a small fly into the ointment – I'll say a few words about Peter Leko's weaknesses. The Hungarian grandmaster is relatively weak in irrational situations. In such positions Leko tries to make a rational, generally solid move, sometimes to the detriment of concrete variations. 17.fxg3!? 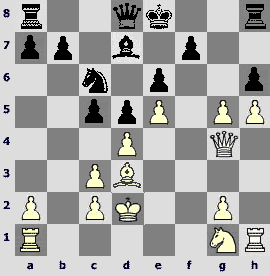 A double-edged decision – in order to open the f-file White weakens diagonal and d4-pawn. 22...¦ad8?! A generally solid move... and a serious loss of time, which allows White to shake down the e5-knight. Betteris22...Ґxb2 23.¤e4 Јg6. 23.Ґb3 Ґxb2 24.¤c4 ¤xc4 25.Јxg4+ Јg6 26.Јxc4.The resulting position is very disgusting to defend, due to the weakness on f7 and problems along the f- and g-files. During the most successful period of his career (2002-2005) Leko lost just 7 games in classical chess, and I think there is a common tendency in these losses. The logically playing Hungarian misses a "sideline" counterplay of his opponent, and tactical complications do not turn into his favor. In exchange for pawn weaknesses Black has a typical Sveshnikov counterplay. 30.Јd7?! Trying to overprotect the g2-square. A concrete approach would have been better: 30.¦d7!? ¦g8 31.Ґd3. White pins the bishop, so Black can't threaten themate on g2, and 31...e2 is met by 32.¦e1 Јh4 33.¦xe2 ¦xe2 34.Ґxe2 Јe1+ 35.Ґf1 Јe3+ 36.ўh1 Јf2 37.Јd3 Јxb2 38.¦c7±. 30...¦g8 31.Јh3? [31.ўh1] 31...Јg6! Suddenly Black creates threats ¦h5 and Јc2, and there is no defense. In general I feel that the Hungarian grandmaster is too correct, too logical. One can rarely see a bluff or psychological decisions against a particular opponent in his games. He does not sacrifice if the compensation is not sufficient objectively, rarely goes for unclear complications. He loses objectivity in assessing positions less often that other players, and almost never goes against the position, although he plays until the end. Can one consider all of the above to be his weakness? Perhaps, yes, if we assume that our weaknesses are sequential to our merits. Correctness is seen not only in chess, but in our hero's outlook too. Clever guy in spectacles, reminding of a classical A-student, sportsman (Leko was a successful football player as a child), happy family man, a person who perfects himself in a chosen field, in which he is already one of the best – here is a portray of Peter Leko. Annotations by A.Khalifman, A.Finkel, L.Gofstein, D.Rogozenko, P.Leko, A.Khuzman, P.Lukacs, S.Shipov and A.Gershon were used.